Australia’s Impressionists, currently on show at the National Gallery, is the first exhibition in the UK dedicated exclusively to works produced by a group of Australian artists towards the end of the 19th century. Arthur Streeton (1867-1943), Tom Roberts (1856-1931) and Charles Conder (1868-1909) are identified as key players in the movement’s evolution, but it’s the inclusion of John Russell’s (1858-1930) work that goes further than attributing the influence of European styles on Australian art and attempts to shed light on the dialogue which existed between the two. The exhibition came about as a result of the long-term loan of Blue Pacific (1890) by Arthur Streeton to the National Gallery in 2015. This was the first occasion for a painting by an Australian artist to be shown at the gallery and instigated a desire to introduce the movement to wider audiences. 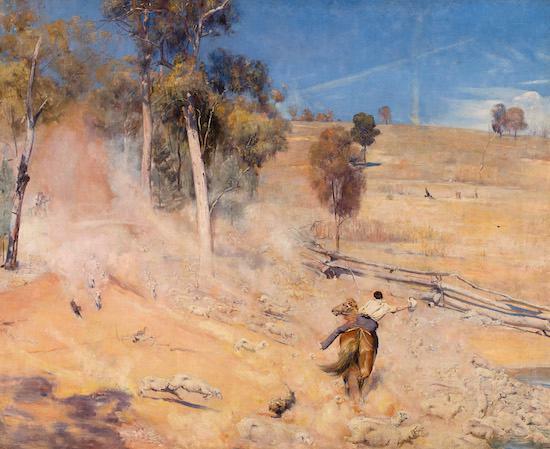 Although the Australian Impressionists were primarily based in the growing urban environments of Sydney and Melbourne, they shared an impulse to paint en plain air in the latter’s rural outskirts of Heidelberg. Drawing on their collective admiration for Turner, Whistler and French Impressionism, as well as having studied or exhibited in Europe, these depictions of the pastoral were considered daring and avant-garde. These visions of the Australian outback were first shown to city-dwellers in 1889 at the 9 by 5 Impression Exhibition at Melbourne’s Buxton Rooms. Over a hundred and eighty glimpses into bush and town life were painted on wooden cigar box lids measuring nine times five inches. These early vignettes are dominated by Whistler’s influence and depict a grim industrial landscape, rather than the blue skies and golden outback used in the National Gallery’s promotional material. The impact of this exhibition is used to frame the opening section at Australia’s Impressionists and immediately introduces the unconventional nature of Impressionism when crafted by members of the Heidelberg School. "It is better to give our own idea than to get a merely superficial effect, which is apt to be a repetition of what others have done before us, and may shelter us in a safe mediocrity, which, while it will not attract condemnation, could never help towards the development of what we believe will be a great school of painting in Australia." 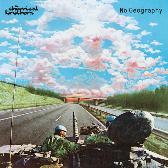 Thus, the painters continued to venture into Australia’s vast outback and remarkable coastlines in a bid to capture Australia as authentically as possible. It is no coincidence that their impetus to carve out a distinctive national identity, albeit tied to European traditions, was taking place in the years running up to Federation in 1901. Whereas the scenes found in the 9 by 5 Impression Exhibition were pocket-size, the section devoted to national landscape involves a change of palette, size and tone. 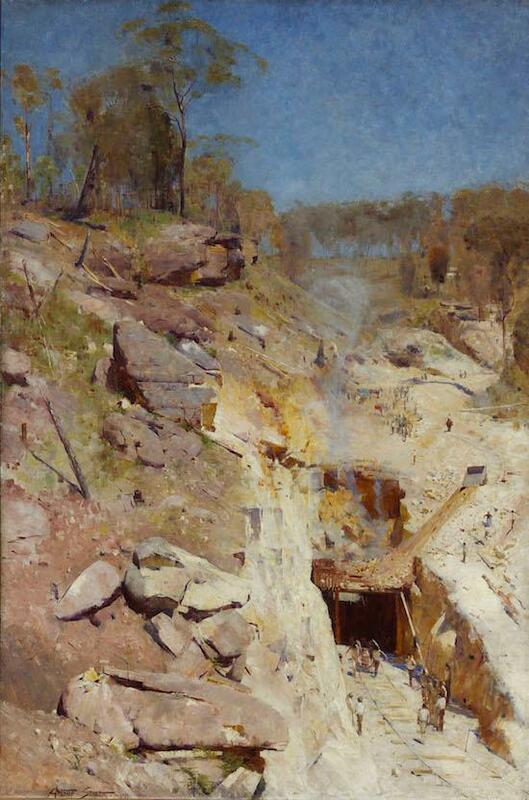 Arthur Streeton’s Fire’s On (1891) and Tom Roberts’ A Break Away! (1891) particularly stand out for their vibrant use of azure and gold. You can barely stand in front of these works without feeling the heat radiate off them and the choking dust coming from runaway sheep or an explosion in a rocky hillside. While John Russell’s works provide a stark contrast to the landscape paintings of his fellow countrymen, they move the focus of the exhibition onto a Francophile’s vision of Europe before visitors can sufficiently question the colonial imagery being presented. Russell’s paintings are chaotic, both in colour and brushstroke; pinks, purples and yellows flourish in meadows and varying shades of blue zigzags dance upon seascapes. It is quite easy to get distracted by the hallucinatory effect of these pieces, yet unsurprising to learn that Russell mingled with the likes of Monet, Van Gogh and Matisse. 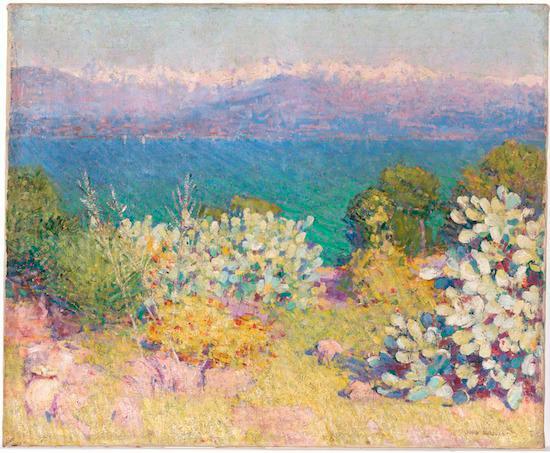 Russell’s contributions to Australian art history broke away from the myth-making of the Heidelberg School, but placing him at the end of the exhibition does more to reinforce him as ‘Australia’s lost Impressionist’ than successfully scrutinise the movement and assess its reception in Europe. In many ways, the exhibition itself comes across as an impression of this period, rather than a truly accurate and in-depth portrayal of life in Australia. While a painting like Fire’s On may depict the real dangers of construction that went into building a nation, it illustrates one aggressively white male narrative. To ascribe these painters so much influence on Australia’s art history and national identity is to oversimplify matters. 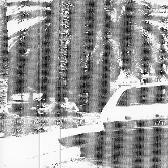 It is deceiving to suggest that Australian art began with the Heidelberg School or their European predecessors. What about the five hundred centuries before European settlers arrived? In her study of Aboriginal history in New South Wales, Heather Goodall, Professor of History at University of Technology Sydney, writes that ‘the Heidelberg School of painters chose not to include an Aboriginal presence in their self-consciously heroic depictions of Australian life and land.’ Despite Indigenous populations working widely in the rural labour which Streeton and Roberts celebrated, they are removed from these contexts and reduced to subjects of ethnographic photography. This exhibition concentrates on four artists who immersed themselves so deeply in their bucolic idylls that the realities of colonialism were overlooked and would only begin to emerge almost a century later. Rather than continuing to perpetuate the heroic myth of the settler, there was potential to re-evaluate the legacy of these works and how they can be read through a post-colonial lens. Following in the footsteps of the Royal Academy’s Australia exhibition in 2013, this may be the first time an exhibition at the National Gallery was devoted to Australian art, but I hope that one day they will be as daring and diverse with the narratives they present as John Russell was with his paintbrush.